Welcome to the MAPCO : Map And Plan Collection Online website. The MAPCO website is updated regularly. Check the 'News' page to see what has been added. Help Keep The MAPCO Website Free! Enjoy the MAPCO website. It is free! Complements access to free online historical Australian maps at the MAPCO website. 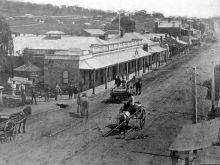 Amongst the items displayed is a panoramic view taken from Sussex Street, North Adelaide, c1872-75. 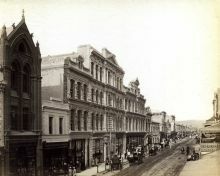 Many more Adelaide and country South Australia photographs are being prepared for display. MAPCO hopes that you find this site of interest. 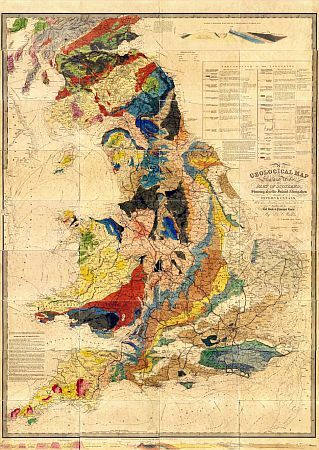 A Geological Map Of England, Wales, And Part Of Scotland, Showing Also The Inland Navigation By Means Of Rivers And Canals, With Their Elevation In Feet Above The Sea, Together With The Rail Roads & Principal Roads, By J. & C. Walker. J. & C. Walker, No. 3 Burleigh Street, Strand, London. c1836. Hand coloured map, dissected and mounted on linen. Folds down to 9¾" x 6¼". Imprint in bottom margin, trimmed, and largely unreadable. This edition probably a secondary state of this map, published c1836, which, despite being heavily re-engraved, still carries the original publication date of 18th December 1835 (see notes on dating). This edition of the map has been re-engraved with significant changes. It has been extended northwards to include Forfar, with inclusion of a 'Geological & Mineralogical Section From The St. George's Channel To The German Ocean' at the top right. The title has been removed from top left and engraved in the North Sea, east of Yorkshire. Imprint reads "Published according to Act of Parliament by J. & C. Walker, Decr 18th 1835, 3 Burleigh Street, Strand, London." State 1 of this map included the name of J.A. Knipe (James Alexander Knipe, Geologist), however, re-engraving and subsequent re-issue of the map occurred during 1836-1837, with Knipe's name omitted from the title. Stanford’s Library Map Of London And Its Suburbs 1864; Showing All The Proposed Metropolitan Railways and Improvements. Published by Edward Stanford, 6 Charing Cross, London, S.W. 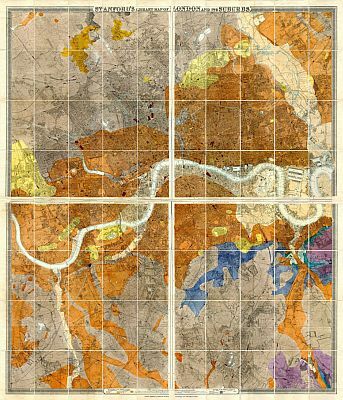 Large scale and highly detailed map of London, with proposed Metropolitan railway lines and improvements overlaid in various colours, numbered. This is the second of MAPCO's copies of Stanford's Library Map of London to be displayed. The railway overlay makes this a unique, fascinating, and rare map, of interest to family historians, local historians, and railway enthusiasts. Enjoy this unique, high quality map of London. 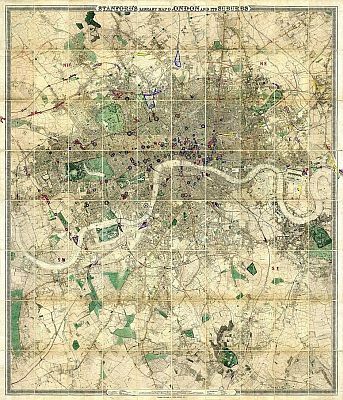 Later copies of Stanford's Library Map Of London And Its Suburbs from 1873 and 1897 will be on display in 2011. This is one of the largest maps to be displayed on the MAPCO website. The detail is amazing. 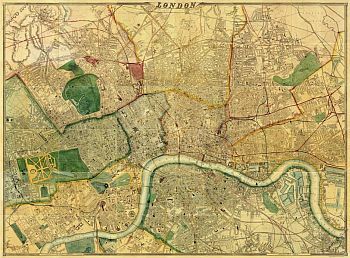 Cassell, Petter & Galpin, who had previously published the map in 1863, declared that their "large map of London, as well as being the largest, is universally admitted to be the best map of London ever produced". This highly detailed map is on a very large scale of 9⅜" to 1 Statute Mile. Chosen because it is simple to remember, this is an easy way to access the map directly. The map can still be reached via the MAPCO website. Similarly the MAPCO website can still be accessed through the Map Of London 1868 website. The map is still part of the MAPCO : Map And Plan Collection Online website. Do take a look at this wonderful map. The detail is truly stunning! This amazing, intriguing, and beautiful map is one of the most significant 19th century maps of London ever produced. This map is arguably the finest of MAPCO's maps on display, and will be of equal interest to family historians, local historians, geotechnicians, and geologists.